Above the milky waters of Cowee Creek near Juneau, three researchers recently gathered to discuss the ins and outs of installing stream sensors: the best PVC pipe configurations, the likelihood of tampering by bears, how to anchor in different stream bed types. These details are emblematic of a much greater effort—one bringing together minds from across the University of Alaska system to study Alaskan regions undergoing climate-driven changes. 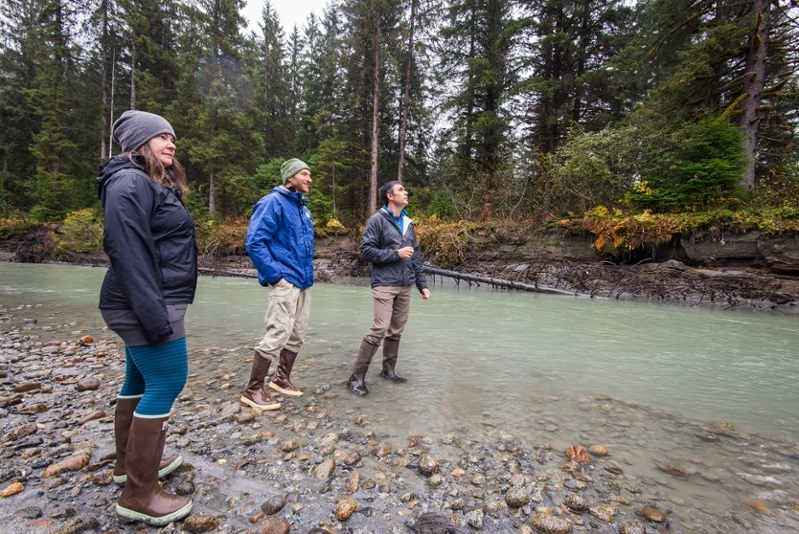 UAA scientists LeeAnn Munk and Eric Klein traveled from Anchorage to meet with UAS researchers who have been sampling stream characteristics around Juneau to understand the flow of materials from glacial and non-glacial watersheds to coastal oceans. This meeting is one of the first following the launch of a 5-year, $20 million effort funded by the National Science Foundation titled “Fire and Ice: Navigating Variability in Boreal Wildfire Regimes and Subarctic Coastal Ecosystems.” The receiving organization, Alaska NSF EPSCoR, will look at changing wildfire regimes in the boreal forest and climate-driven impacts to the nearshore Gulf of Alaska. The project will involve more than 30 faculty members across the UA system, as well as new faculty and postdoctoral hires and dozens of graduate and undergraduate researchers. Next May Munk and Klein will initiate a complementary stream monitoring program around Kachemak Bay in Southcentral Alaska. Knowing what sampling techniques work and don’t work in unpredictable river systems is indispensable when setting up stream sampling sites in remote locations; mistakes are not easily fixed with a quick return trip. That’s where the expertise of UAS researchers Jason Fellman and Eran Hood comes in. “I think the coolest thing about Alaska EPSCoR is the chance to connect with colleagues like Jason and Eran and bring together some of the best minds around the UA system on this,” said Munk. Since 2011, Fellman and Hood have worked with students and research assistants to collect monthly stream characteristic data and garnered knowledge along the way. Temperature, dissolved sediment, and streamflow are just a few of the parameters they measure regularly. In some instances, they use carbon isotopes to trace water—be it glacial, snowmelt, or rain—back to its source, and to look at the extent of glacial influence in watersheds. As part of the Fire and Ice Coastal Margins team, UAS and UAA researchers will coordinate to collect stream data across 12 sites in Kachemak Bay and Lynn Canal. Their work will build a regional understanding of freshwater influence on marine environments across the Gulf of Alaska, and of how climate change is altering these processes. Dynamic stream information from the Fire and Ice project will also help to improve freshwater runoff models of the Gulf of Alaska and to map the flow of freshwater into coastal estuaries. For more information about EPSCoR and the Alaska Coastal Rainforest Center visit the ACRC website. Alaska EPSCoR is funded through NSF award #OIA-1757348 and the State of Alaska.